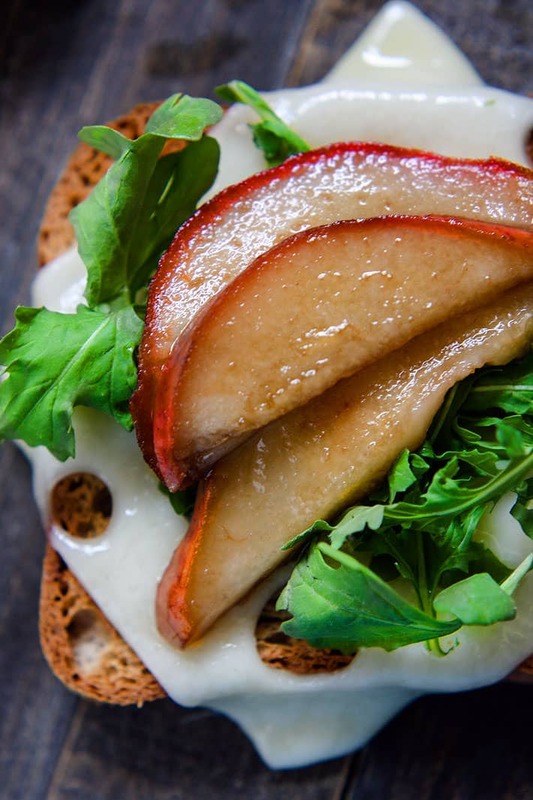 Balsamic-Glazed Pears on Gluten Free Rye Style Toast – Vegetarian Recovery Meal! 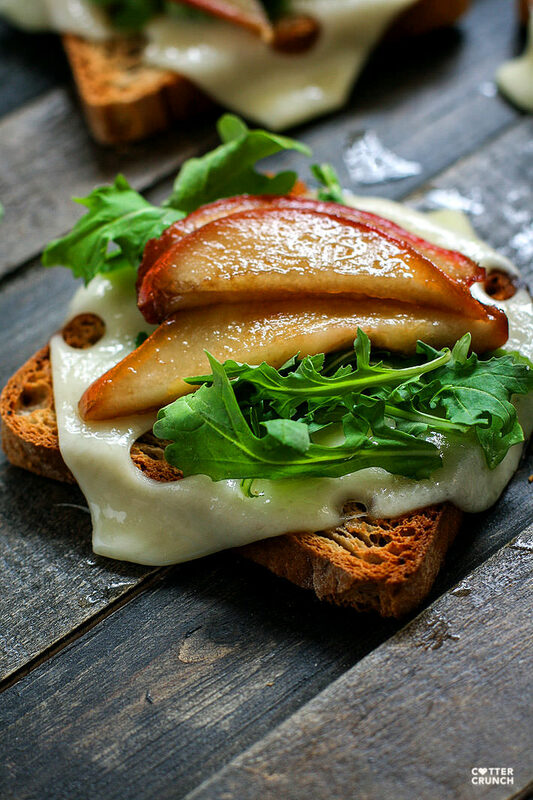 Gluten free rye style toast with honey balsamic-glazed pears, Swiss cheese and arugula! 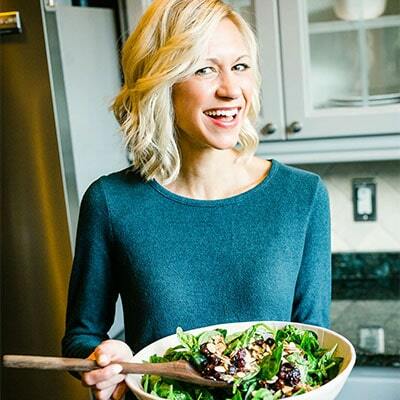 A delicious vegetarian meal perfect for a quick lunch, appetizer, or post workout recovery meal or snack! Balanced with gluten free whole grain carbs, protein, and healthy fats! Have you ever woken up the next day so sore and asked yourself, “what the heck did I do to feel so sore?” No? Just me? Haha, I seriously doubt that. But honestly, I think the main cause of that is not from what you did (unless it was new workout) but rather, what you didn’t do. Like eat enough healthy carbs to restore glycogen in the muscles. Or protein to rebuild and restore the muscles. Or water to rehydrate the body and the muscles. Um, you get what I’m saying here, right? Sometimes it’s not the workout or the training run itself that makes us sore, but more the LACK of proper recovery. Yep, that refuel window is pretty darn crucial. Trust me, I’ve learned the hard way and so has my husband. Which leads me to today’s totally awesome and super delicious “recovery meal” recipe. You remember my last vegetarian recovery sandwich, right? 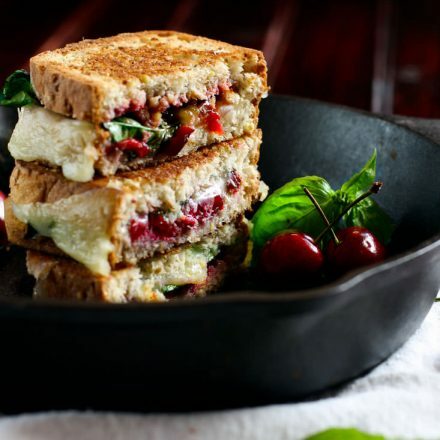 The cherry, provolone, and basil grilled cheese? Gah, so good! 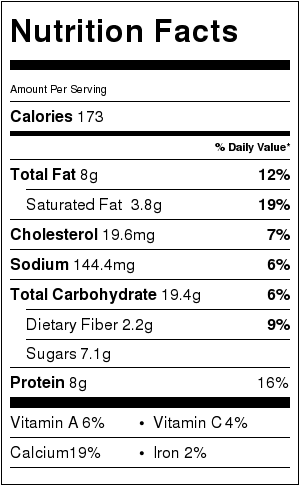 And of course you don’t need to be an athlete to enjoy that delicious gluten free sandwich, but it does help to know it’s powerhouse nutritional perks! But since cherry season is over (sigh), I thought I’d share another favorite recovery meal that is in season. I’ll get all dorky on you and talk about these SUPER FOOD ingredients and why they play a key role in recovery and in general health! First, I’d like to thank Udis for sending me their new fabulous gluten free RYE BREAD! This gluten free rye toasts up great and makes for a perfect healthy carb choice. Plus I love that it contains caraway seed, which we will talk about below! Caraway Seed (in the Gluten free Rye toast)- Great source of minerals, including Manganese. Manganese is used by the body as a co-factor for the SUPER anti-oxidant enzyme, superoxide dismutase. Oh and did you know that they use caraway seed extraction in topical cream to soothe sore muscles? Very cool, although I don’t recommend you rub the bread on your muscles. It’s much better ingested. Yes, I am being funny. Arugula – Also known as Salad Rocket. Funny story there. When we lived in New Zealand, every deli or restaurant had “rocket salad” on their menu. I just thought it was supposed to be a POWER salad or something. Haha, I quickly learned that I was wrong. Anyway, back to Arugula. This spicy green is packed with Vitamin K2, which we need for bone health. Arugula is also very high ORAC (oxygen radical absorbance capacity), which means HELLO ANTI-OXIDANTS! YES! Honey combined with the Pears – Natural sugars to restore glycogen and honey is great for immunity! Have I talked enough to get you hungry for this gluten free rye toast? I hope so. Nutrition Nerd talk always makes me hungry. First toast your rye bread and set aside. Slice your pear into strips and add honey, dash of sea salt, and balsamic vinegar to a small pan and sautee on medium heat for about 5 minutes. HOney will bubble a little bit. Next place your cheese on your toast and place under over or toaster oven on medium heat until melted. 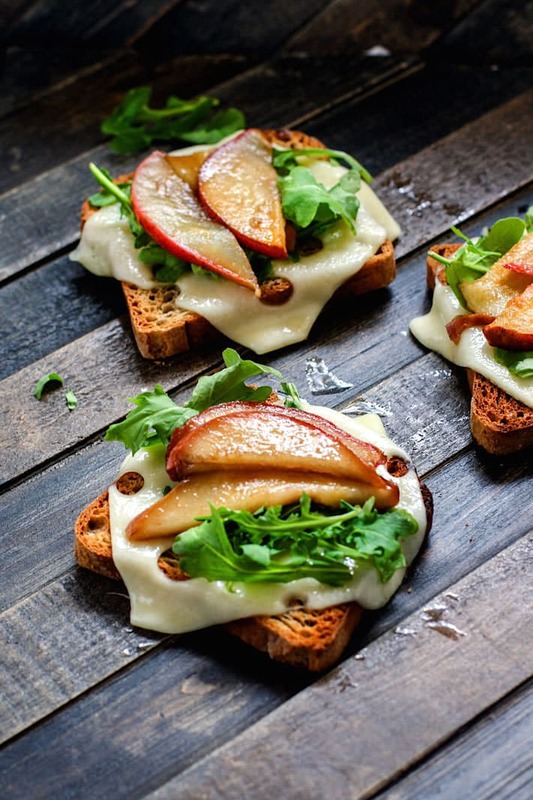 Place a small bunch of arugula on top of cheese and then add about 3 or 4 slices of pear on top of that. Drizzle with the remaining glaze from the pan. Since Pears are now in season, have you grabbed some yet? What about on a sandwich? I’m thinking brie and pear are next on the list! Healthy #vegetarian recovery meal! 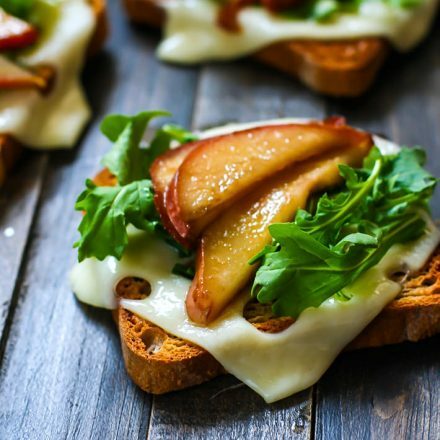 Honey Balsamic-Glazed Pear on @udisglutenfree Rye Toasts! 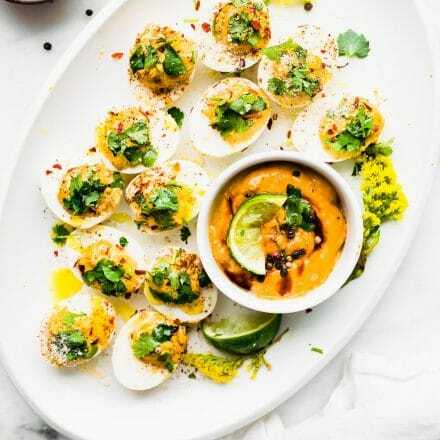 Love everything about this recipe. Especially the simplicity. Oh my! This looks too good! You know how I love balsamic! 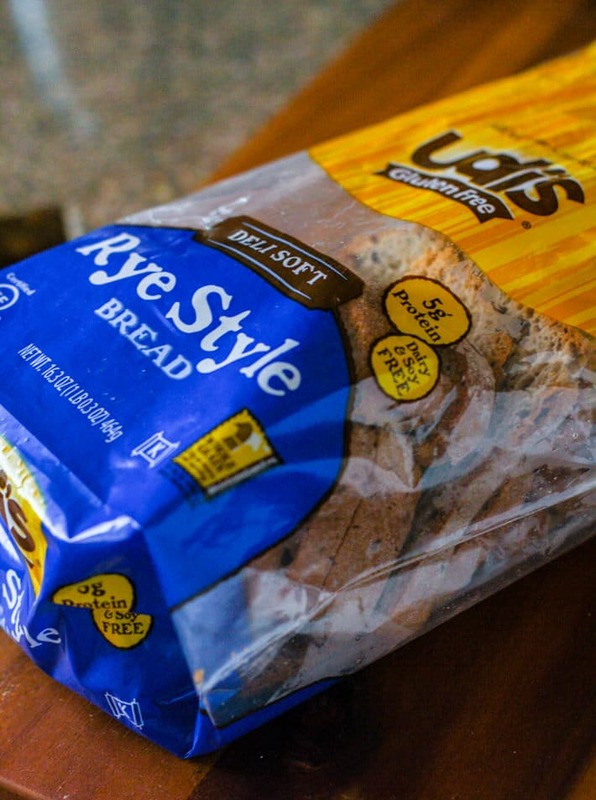 Rye bread was always my favorite, I think I’ll have to try out the Udi’s at some point. i know, so thought of you! I love balsamic roasted pears–the sweet acidity is such a perfect match and foil for the pears as they take on more sweetness as you cook them. Rye toast is one of my favorite breads (that and pumpernickel). But I gotta find a good Jewish deli first! Vitamin K2 is so good for calcium absorption. I don’t think many know that. No wonder I love Swiss cheese. Do you have any issues with eating dairy and having gluten intolerance? I notice I have to be careful with it. Just curious! When your gut is still healing, especially for gluten, it can be sensitive to dairy. I find that aged cheese and cultured dairy work well with me now. as long as it’s low lactose. but i did avoid dairy for 3 months before until it was healed. does that makes sense? It does! Next month is my 3 month mark. I will be re-tested to see if my hormones are trending up and liver & kidney function has improved. I’m excited to see the results! I definitely remember your last delicious sandwich and this one looks just as fabulous! Yummers. 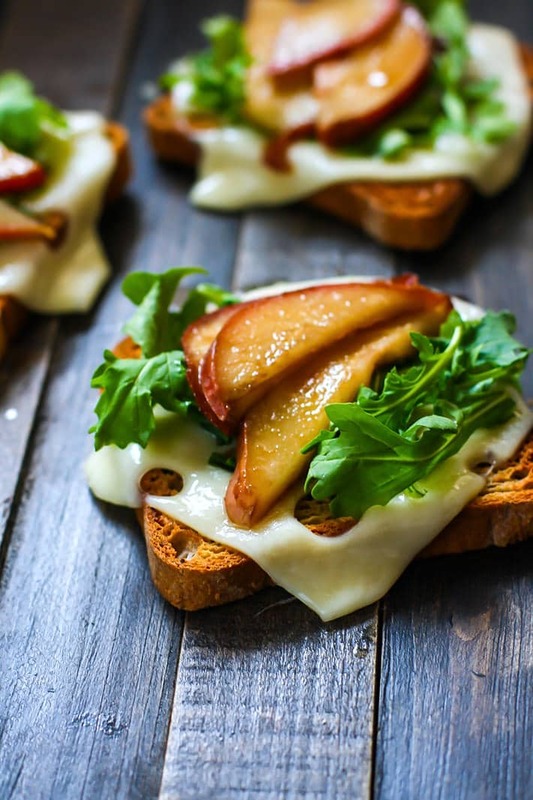 I love the sweetness of pear and honey on a grilled sandwich (or pizza). I’m so excited about this rye bread!!! And I am a huge pear lover! Bosc will be number one, but Anju are my second loves! Yes!! you’re going to love it! that i know! oh good! glad I didn’t bore anyone. LOL! Oh my gosh you weren’t kidding–TWINS. This version sounds so good! hehe, see! twins. But i love it. You’re the best food partner! i know, right? we share a brain! I am hitting the gym right now so I can come home and enjoy this recovery meal–it is perfection! oh apples will be divine too! YUM! First – lady, this is one heck of an awesome recovery meal! And, second, your photos are STELLAR!!! Gluten free rye toast?! Yes, please! That was my yesterday! I hit my legs hard on Monday and then I could barely move yesterday. THE WORST. 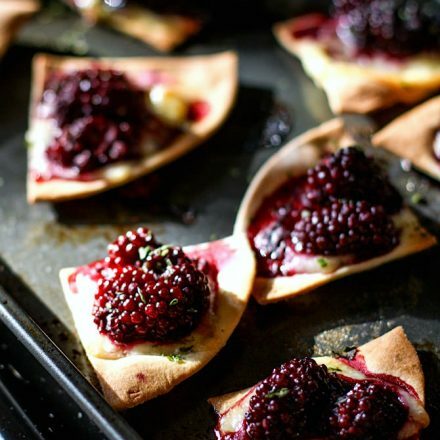 Next time I am making these gorgeous toasts! I LOVE anything balsamic glazed! Pinned! So making this!! I love Udi’s, I am so grateful for GF bread that still tastes like bread for Dave’s sake! He’s really had a tough time going GF, nut free and peanut free all at once. It’s an experience for both of us lol! But who wouldn’t get excited for melty cheese and balsamic pears. Oh I”m drooling!! Oh, I love pears! This looks so delicious and satisfying – perfect for the fall weather that is settling in! Your pictures are so gorgeous! I really want to eat this sandwich for a second lunch right now. And you are so right, pear and brie would be amazing! Now this is just beautiful. And I love how you always talk about the health benefits of some of my favourite foods. I swear that I could eat honey by the spoonful, and the pairing of fruit and cheese on a sandwich is just to.die.for. Love this! 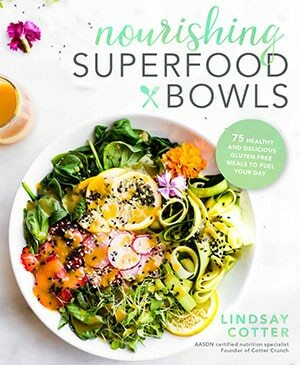 You are so sweet to include a dairy-free option Lindsay! The new Follow Your Heart slices (not Vegan Gourmet) are great on toast, too! What a great breakfast or lunch idea! Oh, yum! This is my kind of meal! I love the sweet and savory combo of cheese with fruit. Pinned!! This looks so ridiculously good! And these photos are popping off the page! Yum Yum Yum! I love sweet and salty chees-y toasts like this! Looks delicious and my mouth is watering looking at the images. it’s a marriage of flavors I can’t get enough of! Haha yes I was confused with the whole arugula/ rocket debate! In the UK we call it rocket and I couldn’t work out what all my US bloggers were on about! We also call cilantro corriander and then there is the usual eggplant is aubergine and zucchini is courgette! LOL! SO true! the eggplant one was tricky for me. They had thai and regular. Yes, please- what a creative recovery meal idea! 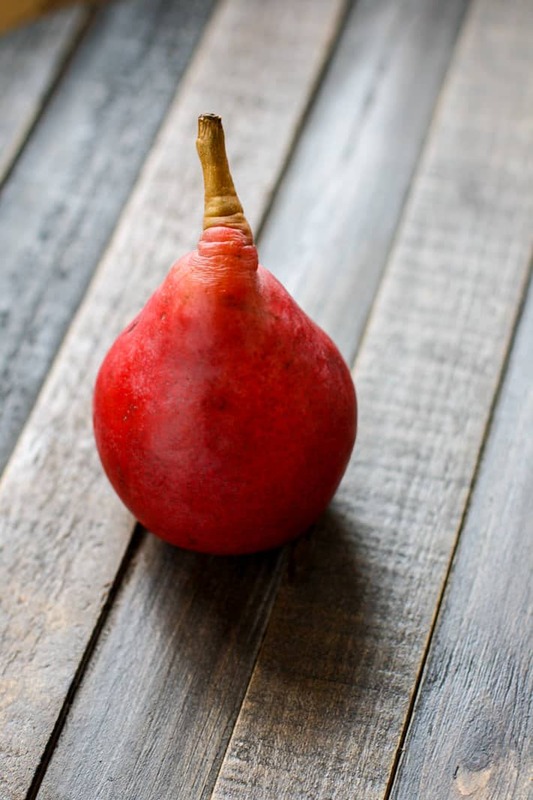 Is it weird that I’ve never seen a red Bartlett pear before? Arugula is the perfect green topping for everything. This looks delicious! I think the honey and balsamic are the perfect flavor pairing for this sandwich. I can’t wait to make this one! Another tasty recipe! I need to get on it with buying some pears. I love them. This looks great lindsay! 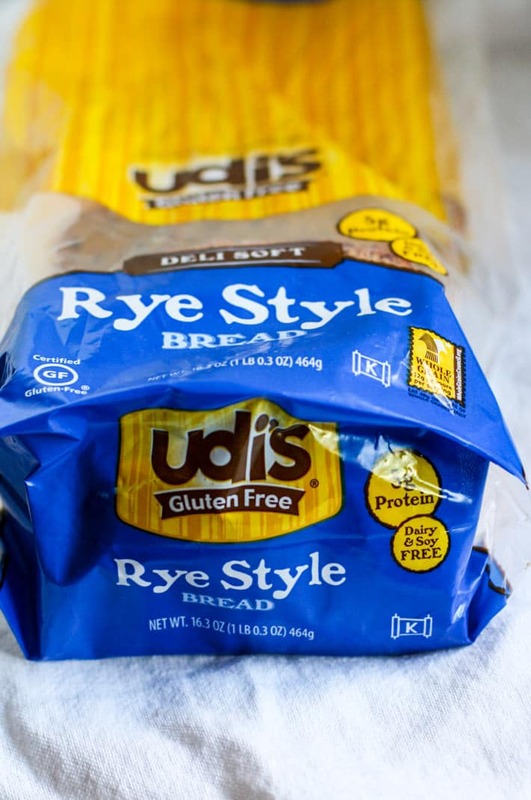 🙂 Haven’t tried Udi’s rye bread.. although I’m curious as to how rye bread is gluten-free.. I always thought rye contains gluten. Have you tried Udis yet? They make the rye with caraway and rice flour. So good! oops, i mean have you tried their other breads? YUM!!! I LOVE this combo! and I bet it would taste great with peaches too. I have tons of them from my CSA which is why I bring it up. Holey cheese hehe. so funny, but again, had no idea of the benefits behind swiss! you are again so wise my friend! You know why I love you? Aside from all the obvious reasons? Because you tout the nutritional benefits of cheese which I think many tend to overlook or forget. They see fat and nothing else. Not you, and these sandwiches are glorious. I would be happy to usher in fall with one of these. Other people can eat all the pumpkin. I’ll take the pears. Yum! 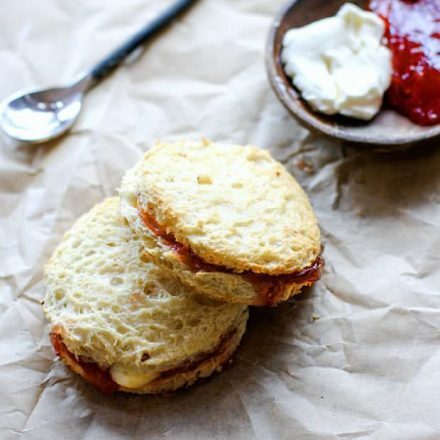 I am thinking of making these as more of a crostini to bring to an Easter brunch. Do you think they’d be okay to make ahead? Or should I assemble them there to ensure that they stay hot and crisp? are you wanting to make the cheese ahead of time too? or just the pears? I think the pears could be made ahead of time then served on warm toast/cheese when ready. Does that make sense? Yes – okay, I’ll plan on that. Thanks for the quick response and can’t wait to nom on these! This ended up working out great! I used gluten free baguette to turn this into more of a crostini, and bosch pears since my grocery store didn’t have bartlett. Thanks for the great recipe! Many thanks for this interesting recipe. But is it too much calories in one flat? Because im on diet and weight loss so i want to make sure that is it okei for me to make this one? I think 2 slices should be just fine and healthy. Do you need exact calories? thank you and may I have the exact number?